While many travelers flock to Europe in summer, spring is actually a great option for travel to various European destinations. Airfares and attractions are cheaper, while planes and places are less crowded. The weather is comfortable and everyone is beginning to see the light of day after winter’s haze. Visiting just about anywhere in Europe for spring is sure to be a pleasant experience – the streets, bars and restaurants are filled with enthusiastic locals, the French are packed into their neighborhood bistros while the British are packed into their traditional pubs for lunch, the Dutch linger over strong coffee while the Italians gesture over tiny espressos and the Spanish fill the evening streets for their paseo and tapas. Concert series are fully underway. Unique art collections are on display at museums, local castles and palaces and everywhere you go, you will find locals enjoying regional specialties and vino from nearby vineyards. Residents truly cherish this time of year because it’s when they can enjoy their cities without being crammed into small spaces by the rush of travelers. This is also the time that seasoned travelers will want to take in the enjoyment of these same places. Here are a few spring destinations to choose from for 2011. An easy daytrip from Amsterdam, the gardens here are truly worth a visit. A riot of tulips and crocuses, spring in Holland is the most colorful time of year. Springtime means the Dutch fields will be rainbow colored and the farmer’s markets will sell 50 tulips for less than 10 euros. In spring, the Keukenhoff gardens are truly at their very best. Avoid hyped prices and wicked long lines by taking your travels to Paris in the spring instead of summer. Overbearing crowds really put a damper on a romantic visit to the Eiffel Tower and can really thwart all your efforts at a romantic experience. 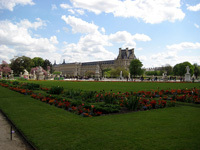 Take a visit to the Palais de Versailles to see the legendary gardens in bloom or take a stroll through the Jardin des Tuileries to admire the well-maintained gardens surrounded by palaces and ponds. Often a spot for picnics, don’t miss out on a visit to Le Pont des Arts for some photogenic moments and people watching. Tip: if you are planning a visit to a popular museum, reserving online before arrival is worth it during springtime too. No matter what season, lines are bound to form and while a half-hour wait in spring is much better than a two-hour wait in summer, no line at all is even better. 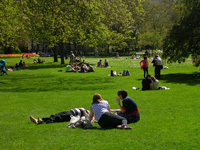 While the winter months in London bring drab weather and heavy clouds, the spring is filled with warmth and sun. Pub terraces reopen, magnolia trees spring all over the city, contrasting against the drab grey buildings, and the weather shifts from blustery to balmy. One to check out is Edinboro Castle, which is located near Camden Town.